Raise your comfort level with these birth tips to cope with pain and labor. First, decide who and what you need with you. Then learn about what you can do with your body and mind during contractions. You’ll be amazed at your ability to discover and stay in your comfort zone. Your birth setting must feel safe to you. It should have space to walk and bathe, as well as a variety of furniture and devices to enhance movement and pain relief: a smart phone, rocking chair, birth ball, low stool, squatting bar and soft bed. It should also have policies that encourage you to try a variety of positions. Access to appropriate medical care is crucial if problems arise. Knowledgeable, caring midwives, doctors, nurses, doulas, partners, and loved ones create a supportive birth team. When you’re treated with respect and patience, stress and inhibitions decrease, and you can more easily find your best coping mechanisms. 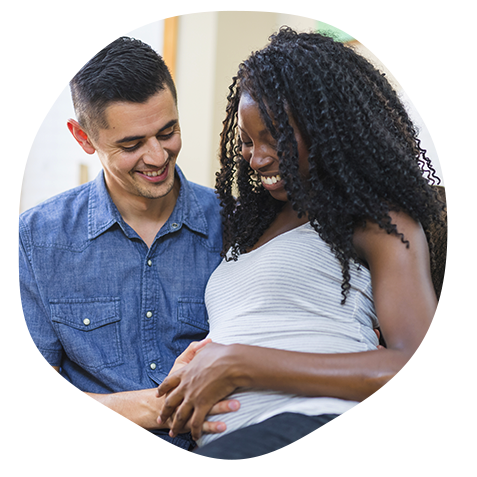 Find out everything you can about labor from trusted books, magazines, websites, videos, childbirth classes, a hospital or birth center tour, and discussions with your health care provider, doula, family and friends. Familiarize yourself with the procedures and customs at your hospital or birth center, and ask about flexibility. Such discussions are best had before labor. More knowledge means fewer surprises. Are you worried about pain and labor, needles, medicines or losing control? Speak with a knowledgeable and trusted friend, childbirth educator or doula. Voicing your concerns can bring relief as well as practical solutions to your concerns. Stating your preferences in a birth plan can also help calm fears. Two types of breathing you may find helpful in labor are slow breathing and quick breathing. Slow breathing is useful in the earlier stages of labor and beyond. In late labor many move to quick breathing almost instinctively just before beginning to push. During contractions, breathe fully in a slow rhythm. Release tension with each exhalation and try moaning. Also try taking quick breaths, about one every two to three seconds (20 to 30 per minute). If you lose your rhythm, your support person needs to help you regain it with eye contact, rhythmic hand or head movements or by talking you through contractions. Focusing on something that makes you happy (like your support person’s face, an inspirational picture or favorite object) engages your senses and decreases your awareness of pain. Listen to music, a soothing voice or a recording of ocean waves, and imagine yourself in a relaxing environment. A warm shower is soothing, especially if you can sit on a stool and direct a handheld showerhead onto your abdomen or back. Bathing in warm water can relax you, and it may even speed up labor. Move around as much as you can. Walk, lean, sway, rock and squat. Some positions will be more comfortable than others. Place a warm pack on your lower abdomen, groin, lower back or shoulders during labor. A cold pack or latex glove filled with ice chips can soothe painful areas. Cool cloths relieve a sweaty face, chest or neck. Whether it’s someone holding your hand, stroking your cheek or hair or patting your hand or shoulder, touch conveys reassurance, caring and understanding. Have someone massage you with light or firm strokes using oil or lotion.